Can anyone shed some light on the 1958 Diario De Noite cards? These are small 'cards' - more like postage stamps really. They all say 1958 on them, but I am not sure if this is because they were published in 1958 or if they are published later but celebrating the 1958 team. Any details about when they were made, how they were distributed etc. would be good. Also, if they were made in 1958, would you consider them to be 'rookie cards' or not? Here are some images from the set (Disclosure - some images were 'borrowed' from eBay). Well, for something to be considered a 'rookie card' it still has to follow certain criteria. In other words, you can't just get any piece of cardboard from 1958 that has Pele's image on it and call it a rookie. If I were you, I wouldn't waste any time on these things. So I can't really dismiss it on any criteria except it is 1/4 the size of the Quigol. Does size disqualify a rookie candidate? I guess you could say it's a stamp since it has perforated edges, but in soccer cards there are a number of stamps that are considered valid 'cards' that are graded by PSA/SGC and can be costly in high-grade (1958 Editora Aguarela rookie has a slight stamp-like perforation, some Sicker Verlags are basically stamps as are the similar 1965 Editrice Verbania set). I'd love to know other opinions on if it could count as a rookie if indeed it was released in 1958. Also, any one know details on the set and release circumstances? No, it doesn't. There are supposed to be 175 different cards in the Quigol set (winner cards included). The Quigols were also released by a company that was printing other cards as well. Brazilians call these cards "figurinhas." The stuff you're posting is very different. They are not figurinhas. Good points! You can make a strong case. For me the jury is still out, however. I agree that the Quigols are considered "figurinhas" and I don't know if people in Brazil would consider these as "figurinhas" or not. I am also not sure what makes "figurinhas" worthy of being a rookie card (considering it isn't a card at all). But if you removed just the Pele card/stamp from the above and had it graded then would it qualify? If it is just whether or not it is a reputable publishing company, then we really need to know more about the Diario Noite company. Did these come in a set and were they distributed in the same was as Quigols? And if so, then would it qualify or is there still something about them that doesn't? In trying to establish a date of release, from what I can tell all of the Diario Noites 'stamps' seem to be of photos from 1958. In fact, two share images of other cards printed in or near 1958 - the Balas Futebol and the Titulares #50. They appear to use the image of the Titulares (which was 1958) and the Balas (also 1958). These particular issues are a "homage" to the winning 1958 World Cup team, which at the very least means that they were published AFTER the World cup (but potentially still in 1958 - potentially August - which is on one of the cardboard). Since the WC was held in June, we can - with certainty - predate the ALFA rookie card to these cards... but still likely 1958 issues, which means that many would still consider them "rookies". As mentioned in may other posts, there is a lot of data that suggests that the Quigol is a 1959 or 1960 card and many still consider than his rookie. I tend to put the Titulares album as issued prior to the World Cup as well as it does not proclaim victory anywhere and the title infers "starters". The "safest" Pele rookies to me are the ALFA, Titulares (though PSA is no longer grading them) and the VAV cards. Anyway, the rookie designation is (somewhat) in the eye of the beholder. Great stuff. I have no issue calling it a RC. I guess this answers my question. These cards are pretty rare and they look awesome, but there are a few things that are bothering me here: firstly, I have not been able to find the album these cards came from, and secondly, were these cards really made in 1958? A lot of collectors see 1958 on the back and assume that is the date of manufacture - this is not true. It simply says that they won the World Cup in Sweden 1958. Well, they seem to feature the 1958 Brazil WC squad and a young looking Pele, so I don’t imagine they could have come out much later. Really gorgeous cards either way. Has anyone seen any sales of the Pele? It looks similar to the one the OP posted. If you compare them, you will also notice that the image posted by the OP looks like it was damaged by UV rays. This leads me to believe that it was probably a store window display. Again, if I got some window display from 1951 that features the New York Yankees, and I were to cut out the Mickey Mantle, do you think I could call it a 'rookie?' You Americans would laugh in my face if I did that, right? Now I do understand that it's different when it comes to soccer cards, because they were issued in other countries, and they come in all sizes and shapes, however, a lot of the old rules that were laid out by Beckett still apply. For example, for any card to be considered a 'rookie' it has to come from a set. It also has to be a base card as well. Pretty much all the vintage soccer cards that we discuss on this forum meet this criteria. Last edited by samosa4u; 11-11-2018 at 01:47 PM. That auction got one bid (not mine) at 10k! While I believe this to probably be a 1958 issue, I am not 100% sure, which is why I could not bid. Given the fact that it is a homage to the 1958 winning squad, at least we know that it is AFTER the 1958 World Cup. That said, I imagine that everyone would be trying to capitalize on the victory in close proximity to the World Cup from an advertising perspective. At the very least my guess would be late 1958 or early 1959 - though I am still trying to track down the album (of which many did not have dates, anyway). There's a set from Argentina that's from 1964 but the only identifying references are the 1962 World Cup. I don't think that just because it says '58 World Cup on it means it's from '58. I wonder what other info SGC has in order to label it a 1958 issue. If I had to guess, none. SGC will slab just about anything and if you're halfway decent at bullsh!t they'll label the flip however you want. Please see below some images a collector friend of mine in Brazil found for me. I have also written out the back page and translated below. 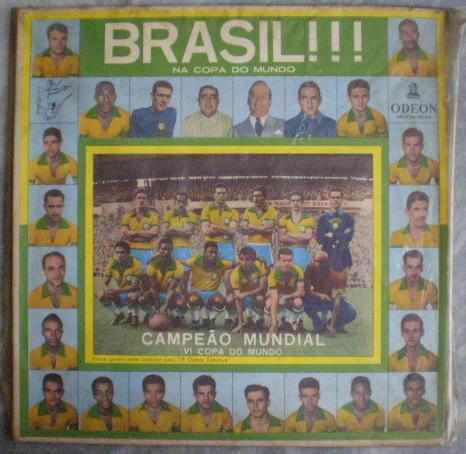 In order to honor the Brazilian stars who took part in the "World Cup of Football - 1958" included in this album a commemorative page in which all our glorious championship players of the world have opened. In the preparation of the complete album this page will be deprecated and delivered to your presentation as a souvenir of the "VI World Cup"
That’s awesome. I need that Pele! I guess there’s no Santos (other Pele)? Great find!!! That is very cool that you found that image. It does indeed look like it could be some kind of display piece. Now that I look closer, it appears that this piece (picture #1 in OP) was maybe used to create item #5 in the OP. However, if it was intended to be cut out and pasted in, then it still might be a rookie, in the same way that a strip card made to be cut out by hand can be considered a rookie. I don't own either item #1 or #5 of the OP, so I can't be sure they are the same and if they were intended to be cut out or not. That said, item #2 & #3 of the OP clearly have perforated edges (like a stamp) and came with a card stock with spots made for gluing them on. I feel like that would qualify as a rookie card, just as much as a Panini album can qualify as a rookie, because they had the same intent as a Panini album. I don't think American rookie rules can apply to foreign soccer issues. For example if Mickey Mantle had a 1951 sticker released via an album, there would be a good argument it couldn't be a rookie card because it's a sticker and goes in an album, as opposed to card board, and stickers and albums would never qualify for a rookie according to Beckett for an American card. But I fully count a Panini sticker from a foreign issued album because this was the manner of distribution for that country and different countries have different 'cards' (or stickers). I think that this basically confirms my thought that it was most likely a 1958-59 issue and can legitimately be called a rookie card.